Falcarragh County Donegal, Visual Arts Centre & Gallery: Location, Opening Hours. An Gailearaí is an outstanding professional gallery run by Gailearaí na gCroisbhealaí Teo. Situated in the Donegal Gaeltacht, it presents high quality contemporary visual art, with a special focus on artists who draw on Irish cultural sources and/or reflect a Gaeltacht sensibility. An Gailearaí also actively promotes its exhibitions and activities to other venues and localities by touring, generously supported by Údarás na Gaeltachta, Donegal County Council, The Arts Council of Ireland and Ealaín na Gaeltachta. Founded in 1998, the centre recently celebrated ten years of operation. During this time it has staged over 50 exhibitions, installations and cultural events, and in addition has organised a wide range of community art projects, supported by numerous fine art catalogues, DVDs and CDs. In 2008, An Gailearaí moved into new and larger premises in Falcarragh, with two customised exhibition spaces, enabling it to improve its presentation of exciting contemporary art to the wider community. Looking through the shows hosted by the centre, I was amazed by their exceptional variety - from traditional works to ultra-modern exhibits. Everything from painting (beautiful landscapes, wonderful seascapes, and much much more), drawings and works on paper, sculpture (in wood, found metal and concrete fragments), fine art photography, and exquisite embroidery, to cutting-edge installations, performance, and multi-disciplinary creative projects. This is an impressive program for any arts centre, but to find it deep in the Donegal Gaeltacht is truly extraordinary. So far, the centre's wide-ranging program has included individual and group shows by painters, sculptors and other contemporary Irish artists such as: Janet Pierce, Willie Doherty, Dermot Seymour, Catherine McWilliams, Jack Pakenham, Mickey Donnelly, Josephine Kelly, Rita Duffy, John McWilliams, Victor Sloan, Brian Hegarty, Bernadette Cotter, Jill McKeown, Paul Seawright, Anne Quinn, Mark Clare, Janet Ledsham, Siobhan Piercy, Liz Salter, Liam OCallaghan, John McHugh, Liam De Frinse, Brendan Ellis, Denise Walker, Barbara Tetenbaum, Oona Hyland, Sarah Lewtas, Úna Campbell and Kevin McGee; to name but a few. In addition to its shows, the centre has undertaken a number of highly successful outreach programs. In 2007, An Gailearaí organised "Sean Nós Nua", on Tory Island, during which the local community was invited to re-examine the age-old tradition of Sean Nós singing, with Lilis ÓLaoire, one of Irelands most notable sean-nós singers and the foremost academic authority on this ancient tradition. The project was supported with a Sean Nós festival, together with an accompanying CD and DVD. Another Tory Island project concerned the development of Féile Soilsí Thoraí and the establishment of a new animation project, Island owned website and Island run archive. In 2008, An Gailearaí initiated another exciting project "Dinnseanchas". Centred on the southern area of County Donegal  comprising Kilcar, Teelin and Glencolmcille  Dinnseachas is a collaborative project between the local community, artist Bernadette Cotter and poet Nuala Ní Dhomhnaill. "Dinnseanchas" is the traditional Gaelic form of the 'naming' of places, the lore of place names. It is a beautiful oral tradition that links both the Irish language and its cultural heritage. This project continues into 2009. An Gailearaí is located in Falcarragh Co. Donegal, 40 minutes from Letterkenny, and just west of Portnablagh and Dunfanaghy towns. Director: Úna Campbell; Manager: Maíre Ní Chasaide; Creative Assistant: Sarah Kernan; Administrator: Maureen McConnell.  For details of local culture and heritage, see: Visual Arts in Donegal. 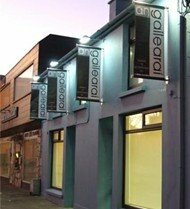  For another Co Donegal art venue, see: Cavanacor Gallery.  For details of the most highly priced Irish works, see: Most Expensive Irish Paintings, and Irish Art Market.  For more about galleries in Ireland like An Gailearaí, see: Irish Art Guide.